There's a lot of great content on Xbox Live – apps, films, music, games and more. If you have a problem when you try to purchase, download or play Xbox Live content on your Xbox 360 console, read this page his page for help. You may get an error message or code when you try to purchase or download content from Xbox Live. If you get a "This Item is No Longer Available" error message when you try to redownload Xbox Live content, the item may have been removed from Xbox Live. Content may be removed from Xbox Live due to regional legal requirements or other issues. In these situations, the item is no longer available for purchase or download. If you have trouble playing content that you've already purchased or downloaded, we have some suggestions that might help. If you have trouble playing downloaded content, see Can't play or use previously downloaded content on Xbox 360. If you purchased a different Xbox 360 console and are having trouble playing content that you previously purchased, check out Xbox 360 Digital Rights Management. This page discusses Digital Rights Management (DRM) and protected content. You'll also learn how to transfer licences and resolve DRM-related problems. If you can't start a film, video, game or app, go to A downloaded Xbox Live app won't launch on Xbox 360 to learn how to delete and reinstall the app. If you see a "Disc is unreadable" error when you try to play a downloaded game, see the Xbox 360 Disc Drive Solution. Because of the large amount of content that's available on Xbox Live, it can be difficult to find exactly what you're looking for. If you have trouble finding a title or add-in, it may be easier to browse all the offerings. Here's how. Note You can schedule the download after you purchase the title or add-in. Go to the Xbox 360 Marketplace. Find the type of content you want, and then select View All. 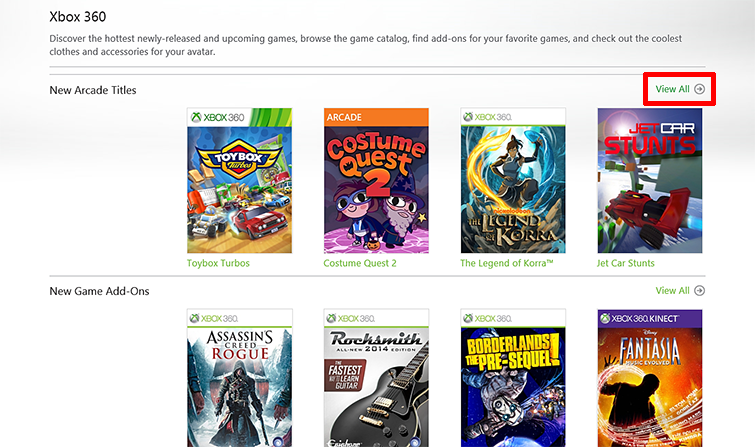 For example, select View All in the "New Arcade Titles" section to search all games. In the SORT BY box, select the appropriate filter. Select the title that you want. Note If you're looking for an add-in for the title, see the "All Downloads" section of the page for that title. When you view all the offerings, the displayed content is the content that's available in the region for your Xbox Live account. Some content is not available in all regions. Also, previously listed content may have been removed because of regional legal requirements or other issues. Would you like to contact Support regarding the "Troubleshoot Xbox Live content problems on Xbox 360" issue you were reading about or a different issue?